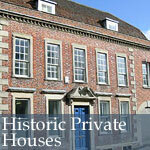 We are able to carry out repairs and restorations to historic residences. We can repair stonework, lead, and roofs and are able to project manage the entire job. Our team are careful, courteous and efficient in their attitude towards site work (and will never be found whistling from scaffolds).